I don’t know about you, but Easter falls at a tough time for me. It comes just far enough after the holidays that my sweet tooth is starting to re-emerge and demand soothing but close enough to my New Years resolution of being healthier that anything more than the tiniest indulgence leaves me feeling guilty. Am I alone here? To help ward off all those chocolate bunnies and their caramel filled eggs, I came up with this Easter fruit arrangement idea. Not only is this Easter fruit arrangement a good idea for me (or anyone trying to not eat their weight in chocolate), but also for my little man. I’m perfectly fine with him having some sugar, but there’s a tendency to go overboard on holidays like Easter. I’d prefer if he wasn’t hoping around like the Energizer Bunny at the end of the day! 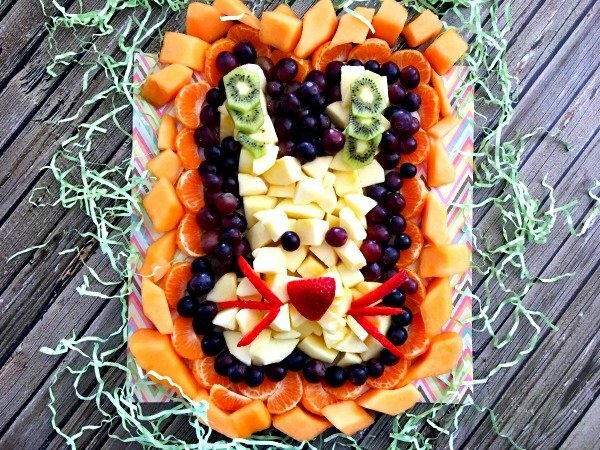 This Easter fruit arrangement, shaped like an adorable bunny I might add, is a great Easter snack whether you’re staying home with your family or celebrating elsewhere. With all the different varieties of fruit included (6), there’s sure to be something even a picky eater will enjoy in this Easter fruit arrangement. If you spend Easter at a family member’s house or church event, this Easter fruit arrangement looks fairly impressive, so I highly recommend whipping it up and taking it along. Plus, it ensures they’ll be something healthy for you to munch on. I know that Easter can be a busy day, especially if you have kids who are dying to hunt for eggs and gift-filled baskets, but this Easter fruit arrangement is pretty quick to make. What takes the longest is arranging your apple pieces into the shape of a bunny. My suggestion? Don’t be a perfectionist about it. 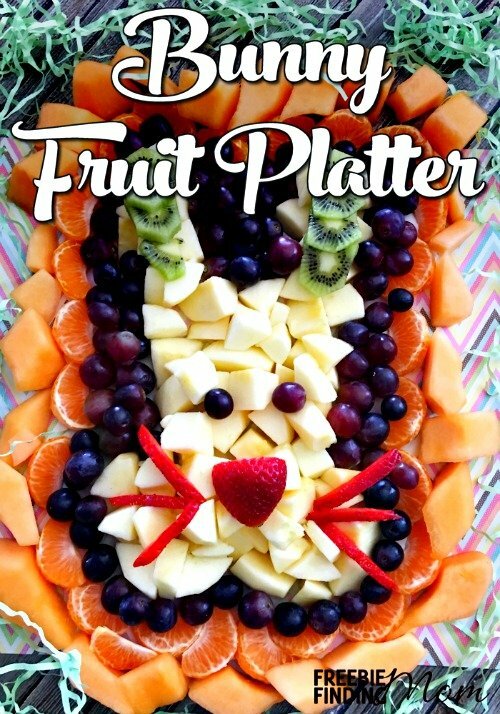 I know, I know, it can be tempting to spend a ton of time messing with the pieces in this Easter fruit arrangement, but just get an approximation of the bunny and move on. After all, you should be spending quality time with your family, right? 2. Peel cuties (oranges) and apples. 3. Remove skin from kiwi. 4. Dice apples into small pieces and put them in a mixing bowl with water and lemon juice. Tip: This water and lemon juice mixture will keep the apples from turning brown. 5. Line platter or cutting board with parchment paper for easier cleanup later. 6. 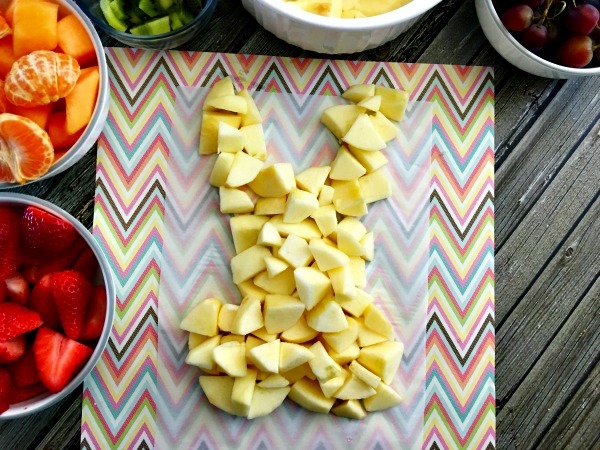 Make a bunny shape on parchment paper with diced apples. 7. Surround bunny with grapes. 8. Place oranges around grapes. 9. Place cantaloupe pieces around oranges. 10. Cut the strawberry in half and use one half for the nose. 11. Cut the other half of the strawberry into six vertical skinny pieces for the whiskers. 12. Cut the kiwi into slices and place them in the center of the ears. 13. 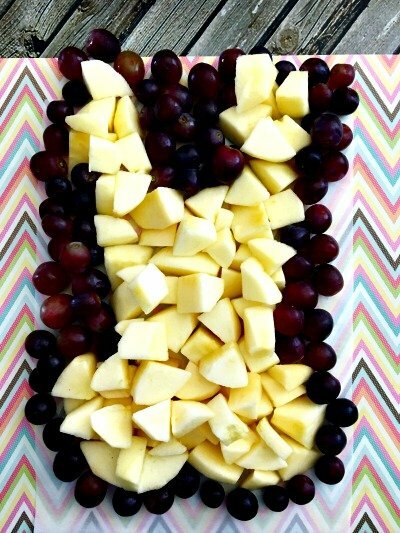 Finish your Easter fruit arrangement off by using a couple of grapes for the eyes. 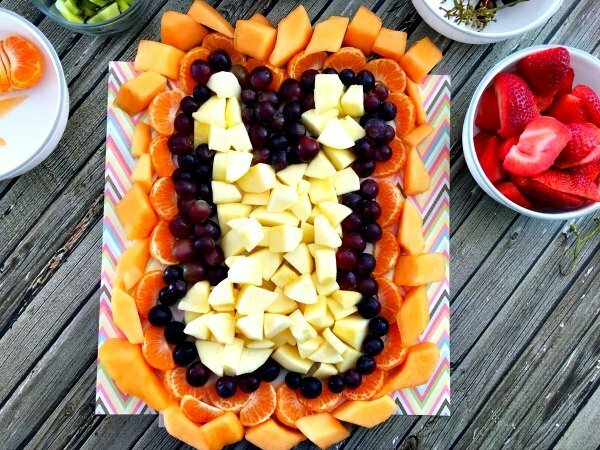 Tip: Consider serving this Easter fruit arrangement as part of Easter breakfast or brunch! Need something to go with it? How about these cinnamon roll bunnies? And if you simply can’t resist just a little chocolate on Easter, try this tasty M&M Easter bark! For additional delicious recipes, follow Freebie Finding Mom on Pinterest where you’ll find Must Try Food Recipes, Decadent Desserts, and much more! Happy Easter from the Freebie Finding Mom! This looks fantastic! Excellent alternative to all the chocolate & sugar treats. I’m definitely going to do this. Thanks for sharing! !